Most cruisers think of repositioning cruises as those between Alaska and the Caribbean or between Europe and the Caribbean. However, as the Far East becomes a more popular cruise destination, some cruise ships travel from the Mediterranean to the Far East via countries on the Red Sea, the Persian Gulf, and the Indian Ocean in Southwest Asia. In addition, world cruises also often include stopovers in these lesser-known, exotic countries. Because of the increasing interest in cruising to this region, some cruise lines have based ships in Dubai during the winter months. 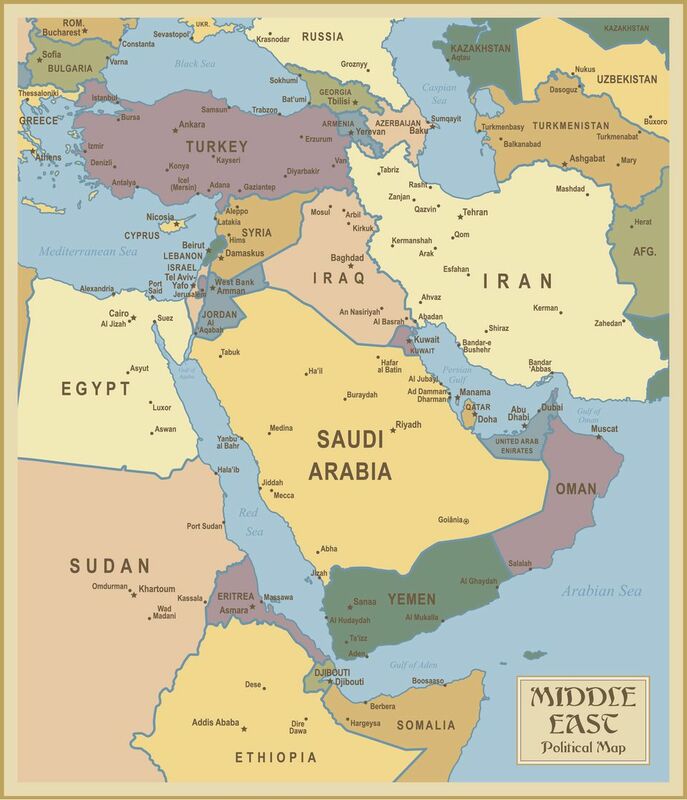 War in the Middle East (or more properly Southwest Asia) has kept many travelers from visiting this region, but a cruise is a good way to tour there in relative safety. The maps below show the most popular ports of call for cruise travelers in Southwest Asia, the Persian Gulf, and the Red Sea. For a country mostly covered with desert, Egypt has many cruise options. Cruise ships sailing the southern or eastern Mediterranean usually port at either Alexandria or Port Said. Cruisers can travel to Cairo to see the Nile River, Pyramids and Sphinx on full-day shore excursions. Nile River cruises provide an amazing look at the wonders of ancient Egypt. Cruises to the Red Sea usually stopover at Sharm el-Sheikh in Egypt for excursions into the desert, St. Catherine's Monastery, or for diving into the brilliant, clear Red Sea. The Sinai Desert covers most of Egypt's Sinai Peninsula, stretching from the Mediterranean in the north to the Red Sea in the south at Sharm el-Sheikh, which is a very popular European tourist destination with great swimming, snorkeling, and diving. Many cruise ship passengers make the pilgrimage north through the hot, dry Sinai Desert mountains to St. Catherine's Monastery (also St. Katherine's), the celebrated location of the burning bush where God spoke to Moses. The drive to the foot of Mount Sinai is three hours each way, but the time passes quickly because of the amazing scenery. Security in the Sinai is very high, and tour buses pass through a dozen checkpoints--both Egyptian and United Nations. Only a few roads cross the desert, and local residents use either 4-wheel drive trucks or the more traditional camel as transportation. Modern coaches stick to the highway, and ride as a convoy with other tour groups from cruise ships and Sharm el-Sheikh hotels. Red Sea cruises also might stop at either Al Grahdaqah or Safaga to enable passengers to go into Luxor on either a full day or overnight excursion. A description of Egyptian cruises would not be complete without a reference to Nile River cruises, which usually travel between Luxor and the high dam at Aswan. Dozens of river ships sail the Nile, so there are plenty of options for Nile River cruises. Cruise ships port in Aqaba (spelled Al Aqabah on this map) on the Gulf of Aqaba on the Red Sea. Jordan has many amazing sites, and cruise travelers usually go north from Aqaba to Petra near Ma'An, into the desert at Wadi Rum, or to the Dead Sea on full-day or overnight shore excursions. Petra is one of the world's new seven wonders of the world, and is an amazing "lost" city in the desert. Although it's a long day trip from a cruise porting in Aqaba, the scenery is interesting and entering the valley and seeing the amazing structures left by their builders will give you lifelong memories. Wadi Rum is a spectacular desert valley about an hour north of Aqaba in the Jordan desert. Its beautiful rocky cliffs and brilliant colors of red, brown, and orange set Wadi Rum apart from other desert areas. Visitors to Wadi Rum can explore the area on foot, via camel, donkey, or 4-wheel-drive covered jeep. T.E. Lawrence, the famous British soldier and diplomat (also known as Lawrence of Arabia) loved Wadi Rum and lived there for at time in 1917. He recounted his many adventures in southwest Asia in his book, the Seven Pillars of Wisdom, which was named after the large rock formation with seven pillars that towers over the desert at Wadi Rum. Cruise ships sailing the Indian Ocean or the Persian Gulf usually port at either Khasab, Salalah or Muscat, Oman. Cruise ships sailing the Indian Ocean into the Persian Gulf usually stop at Dubai, Abu Dhabi, or Al Fujayrah in the United Arab Emirates (UAE). Cruise ships sailing the Persian Gulf might stopover in Doha in Qatar. Cruise ships sailing in the Persian Gulf will port on the island nation of Bahrain.